Softball 12” New Old Stock-Amazing Vintage Graphics on the Unopened Box- 1940s? 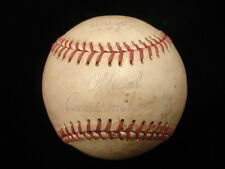 Softball 12” New Old Stock-Amazing Vintage Graphics on the Unopened Box- 1940s?. No manufacturer name to be found. The box is stamped “CG 11” Shipped with USPS First Class Package (2 to 3 business days). 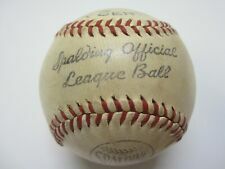 Vintage Lot of 1940s or 1950s Mid-Century Baseballs White Leather Red Stitching The mini ball is a keepsake from a June 4, 1954 game at the Nashville Sulphur Dell. BALL PRODUCTION DATES : 1940's to 1950's. BALL TYPE : Team Logo Golf Ball. BALL MANUFACTURER : Spalding. The Cat's Pajamas Collectibles. Official League Rubber Center. "Wilson Baseball". Sealed in Box. So keep in mind that all clothes needs to be washed or dry cleaned. Made of Horsehide. Made in USA.